Moore Corporation Limiteding equipment is designed for the off-line forms processing of computer generated printed business forms. 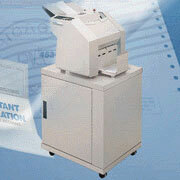 Equipment includes a cut-sheet imprinter, decollator and detacher. The cut-sheet imprinter prints documents that require a signature, such as a payroll check or letter, on a cut-sheet printer. It is capable of applying a signature and/or static message on various length forms without changing settings. The decollator removes a continuous web of carbon or carbonless paper from multi-part continuous webs/pads of paper, while at the same time refolding the multiple webs into separate pads. The detacher, also known as a burster, separates the continuous pads of computer generated printed forms into individual sheets in alpha and/or numeric sequence. Some models imprint a static message and/or signature on documents.